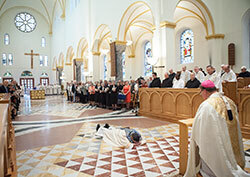 In a liturgy replete with deep and ancient rituals, Archbishop Joseph W. Tobin solemnly blessed Benedictine Archabbot Kurt Stasiak on July 26 at the Archabbey Church of Our Lady of Einsiedeln in St. Meinrad. Archabbot Kurt was elected the 10th abbot and seventh archabbot of Saint Meinrad Archabbey on June 2 by the solemnly professed monks of the southern Indiana monastic community. 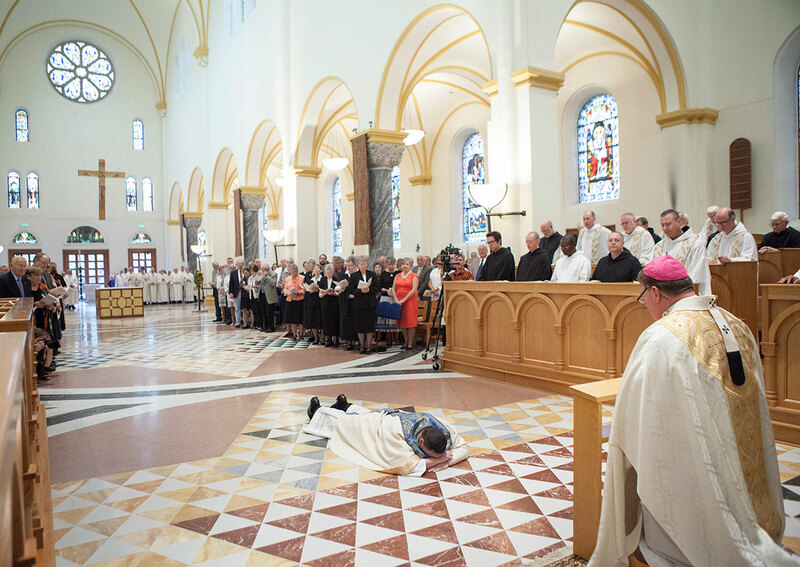 The Mass involved Archabbot Kurt laying prostrate on the floor of the church while a litany of the saints was prayed. He also ritually received a book of the Rule of St. Benedict, a miter, crosier and ring in addition to the blessing he received from Archbishop Tobin. Although abbots use much of the regalia of bishops, they are not ordained to the episcopate. Saint Meinrad Archabbey, which was established in 1854, has operated Saint Meinrad Seminary and School of Theology throughout much of its history. Some 80 percent of the current priests of the Archdiocese of Indianapolis have received at least some of their priestly formation at Saint Meinrad, many studying under Archabbot Kurt when he taught sacramental and liturgical theology there. Benedictine Father Justin DuVall, Archabbot Kurt’s predecessor, led Saint Meinrad Archabbey from his election on Dec. 31, 2004 until his resignation, announced earlier this year, took effect on June 2. He now serves as vice rector of the archdiocese’s Bishop Simon Bruté College Seminary in Indianapolis.